Thanks to Yolanda for sending me this really well-researched, well-presented, fascinating documentary. 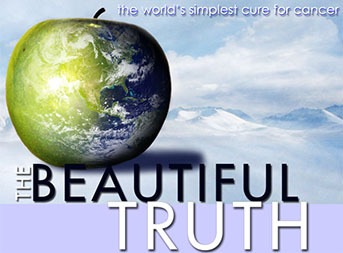 The Beautiful Truth examines the unnatural causes (and natural cures) for cancer by following and documenting one 15 year-old boy's quest for the truth. Raised on a wildlife reserve in Alaska, 15-year-old Garrett was interested in the dietary habits of the farm animals. After the tragic death of his mother, Garrett's father decided to home-school his son and assigned a book written by Dr. Max Gerson that proposed a direct link between diet and a cure for cancer. Fascinated, Garrett embarks in this documentary on a cross-country road trip to investigate The Gerson Therapy. He meets with scientists, doctors and cancer survivors who reveal how it is in the best interest of the multi-billion dollar medical industry to dismiss the notion of alternative and natural cures. Diseases have a much deeper problem that the modern science does not even consider and even understands as a matter a fact. The ancient Ayurveda, the most advanced form of natural healing never had any side effects. It was based on the concept 5 elements, and it talks about the three major flaws in people called "tridosha" (three defects - also hinting towards God Shiva). Diseases are created from all the negative energy that accumulates within the body and over a period of time it physically manifests itself. Those who end up accumulating a massive amount of bad energy, end up having problems like cancer. The "virus" itself is not the problem, it is only a medium of manifestation. Ejecting the negative energy from your system is the true long term "cure". Which eliminates the problem from "Recurring" again. This is the knowledge "Allopathic medicine" is devoid of, and hence the British East India company Marked off "Ayurveda" as primitive, even tho it has no side effects. Can you see the dark wave of destruction? This is the very reason why bigger and badder diseases rear their ugly heads every single day, because "Allopathy" is made for immediate relief, and not long term fix. As it does not treat the negative energy accumulating inside you, its inevitable that bigger-badder monster(disease) will get you. Why does cancer returns even after it has been operated on, and completely removed? Even if they make the appropriate changes in "allopathy" to include the knowledge of the 5 elements, it will never match the original. The echo is always weaker than the original wave. Exactly, petrochemical pills to cover up cancer symptoms, unnecessary and dangerous surgeries to physically cut out tumors, or expensive chemotherapy to try and radiate the cancer to death (without killing yourself in the process) are the options given by Allopathic medicine. But when you research the actual causes of cancer (i.e. nutrition, environment, and lifestyle... processed foods, aspartame, fluoride, MSG, GMO, free radicals, pesticides, vaccines, lack of exercise, lack of positivity, obstructions of life force energy etc.) it's plain to see that pills, surgery, or chemo will only cover up your symptoms and provide temporary remedy while the factors that caused the cancer in the first place remain unchanged. It's like repeatedly stabbing yourself in the stomach then going to the doctor and asking him to remove your hand in hopes that you'll be able to stop stabbing yourself. one of my school friend's mother died of "chemo" therapy. Its funny, they add the word "therapy" at the end of such kind of science, giving false hope to people that it would actually help them. Many people get lured in by the word alone. Will people go back to the old ways, even if i tell them what they have long lost? Petrochemicals will not last forever, they will come to an end. Which shows us the possibility that people will return to the old ways. Thankfully. Unless nuclear power plants destroy nature completely first. Ahhh, eat light to be LIGHT!